Is CNRL Continuing to Drill for Heavy Oil? This week saw Canadian Natural Resources Limited (CNRL) significantly extend its investment in heavy oil with the purchase of Shell Canada’s oil sands interests. And yes, licenses issued to CNRL suggest it’s drilling program will continue to be very active, especially in in heavy oil (crude bitumen). The chart below shows that 136 licenses have been issued for CNRL between 21/11/2016 – 09/03/2017 (the last 3.5 months). As we see from the donut chart, these licenses were made up of over 67% crude bitumen, as represented in green. 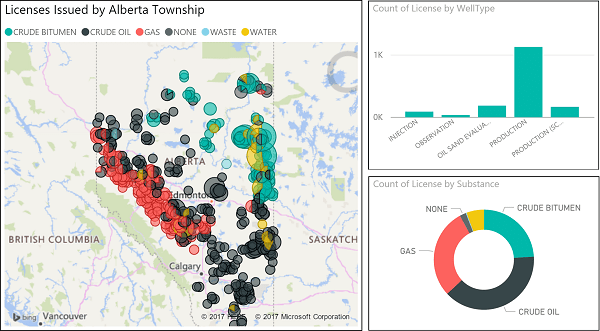 For context, the chart below shows all 1615 licenses that were issued to operators in Alberta during that same period (including CNRL). 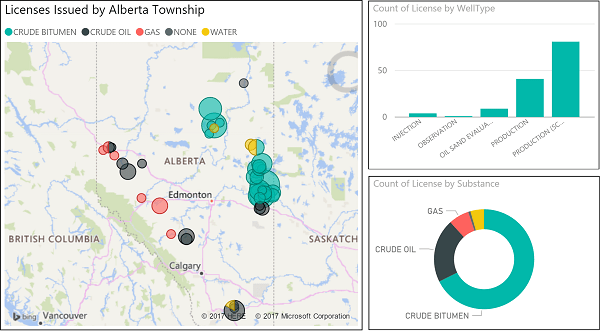 The donut chart now indicates a more even distribution of licenses; crude bitumen represents just over 24% of the total. It is also interesting to see where in Alberta operators hope to find gas (in red), crude oil (in black), and crude bitumen (in green). This analysis was largely based on the AER Well Licenses Issued (ST1) file. To see numerous other dashboards on the subject, please see this link.